Twenty years later, a small population of humans is still alive on the moon. Previously dismissed and laughed about as a waste of money, the Moon Colony is now humanity's last shelter from the insanity of war. But the Moon Colony was never meant to be completely self-sufficient, and now resources are finally running out. But Earth is no longer the Earth we knew. Things have shifted; out from the cracks in reality, creatures have come that live in the darkness between the worlds. The atmosphere is often poisonous; radiation from Soviet bombs is widely spread; and in some places, reality itself is so fractured that not even your ship's shields can protect you. Phenomenon 32 has turned the Earth into something... unknown. The central design concept, except for having an interesting story and scaring the crap out of some players (while definitely boring others), is to have a really detailed cockpit, and one that really functions. 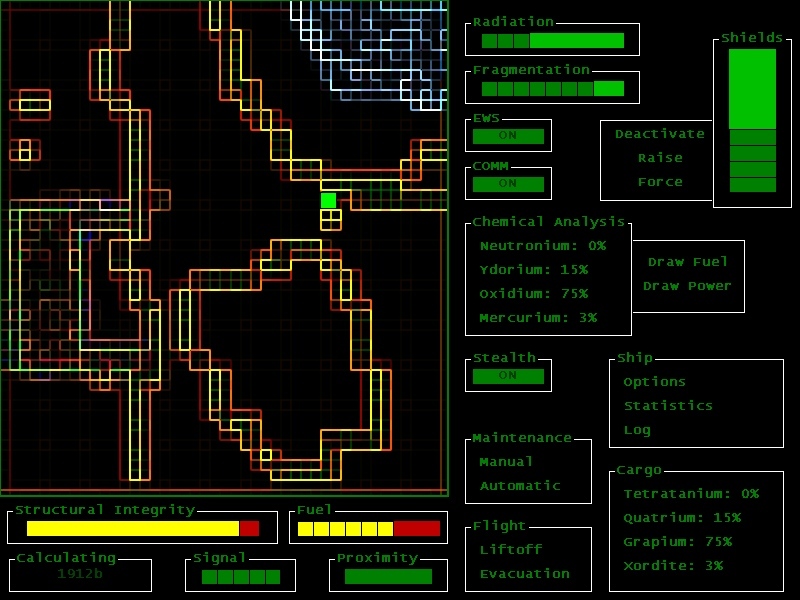 The screenshot above is not entirely complete: there will be quite a few more controls and tools. These are designed so that you really have the experience of piloting this ship in the surreal horror environment of Earth; not in terms of not-hitting-rocks-and-exploding, but in terms of understanding and using the readings and settings. UPDATE: See my post on page three. I am still going to finish this, but I don't want to release a crappy version. First, the graphics looks astounding and very inspiring! Second, this is ambitious! I hope you'll pull this off and look forward very much to playing the game! Hat's off to you, sir! If you manage to pull this out, I congratulate you. Very epic and extremely cool concept. holy crap that looks awesome. please finish. This sounds really cool. I wasn't sure if you were going to keep making games after I read this, so it's nice to know you still are. Nice to see people are interested! I hope you won't be disappointed... especially since the thing isn't 3D or anything. Anyway. Spent most of today working out interface issues, and figuring out some basic design questions that need to be resolved. A lot of stuff is already working, including moving around the map, changing your statistics, and a basic version of combat. More screenshots will follow when the interface is complete. Sounds like it could be a really cool game. It's quite ambitious, so I hope you can manage to complete it. Spent some time making sure the game will also run properly on monitors with higher DPI settings, which was a problem with my previous game, Desert Bridge. 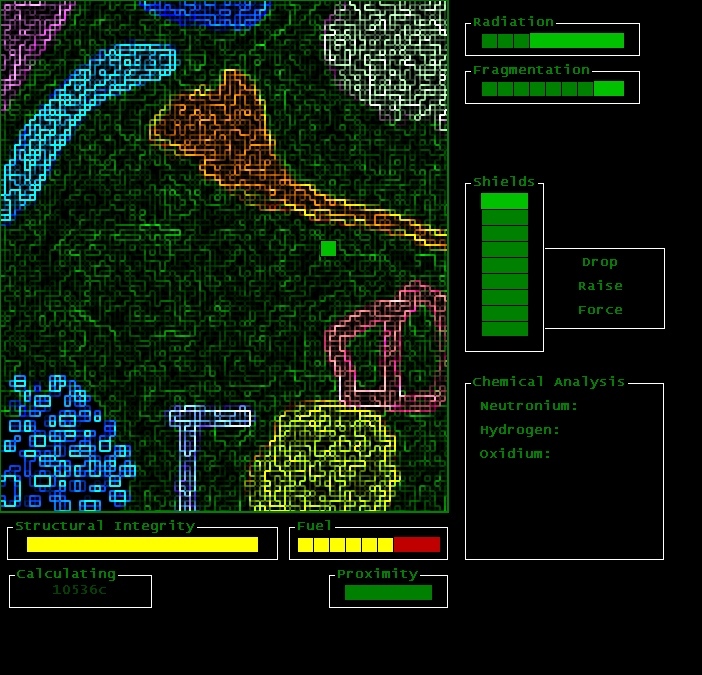 Most of the interface (and with it, the game's basic functions) is working. A few more little things have to be added, but they're not very difficult. I do have to differentiate more clearly between the various aspects of the shield, though (current amount, current maximum amount due to damage, maximum amount in general). Next up is the base to which you can return for upgrades, research, and so on. Actually, I came up with a better system for handling the shields, based on a "power" stat that affects both the shields and combat. Sometimes there really are very simple solutions to seemingly difficult design issues. So is it sort of hard sci-fi? Well, not exactly. In terms of style and gameplay, yes. In terms of actual physics, no. Made quite a bit of progress in the handling of the various statistics. Also cut my finger on a piece of glass, which makes programming extra fun. Currently implementing the Short-Range Communications system, which allows you to talk to possible survivors and pick up radio signals and the like. Whether or not you can communicate is based on how strong the SRC signal is and how good your overall reception/signal is. You can research better equipment that will boost your signal stat and make communication easier. NOTE: The dialogue in the screenshot is just a test. Bob the Spider is not actually in this game. This seems like incredibly good stuff. Only thing I don't get is how those grafics can be 3D? Phenomenon 32 will be a 2D exploration/strategy/RPG game. I hope you won't be disappointed... especially since the thing isn't 3D or anything. The graphics are 2D. 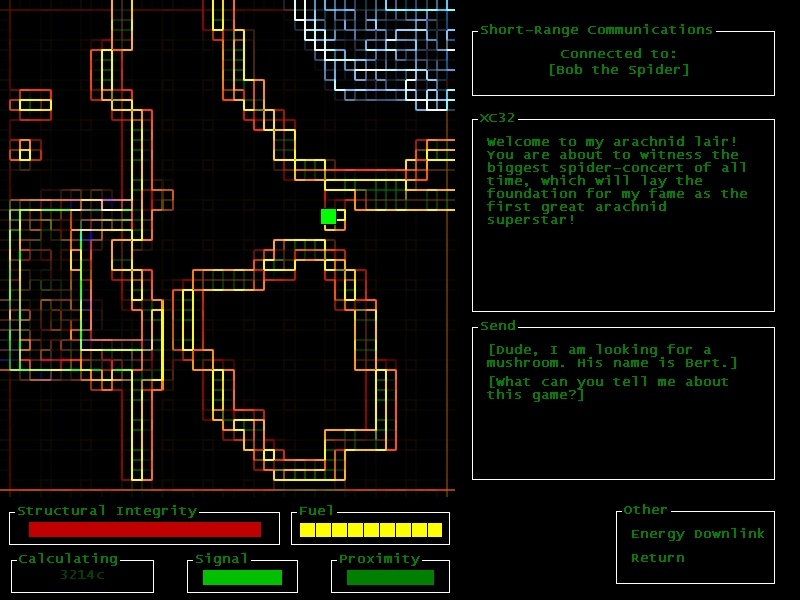 Essentially you're navigating a map, with tile-based movement. Think of it as some kind of future-radar. I fancy I might be up for voice acting when you need some. Send me some text and a character description or two to audition for. Currently building the tech tree (gardening, you know) and related research stuff. Then it's off to the game world. The schedule is tight, but it should be doable.